Product prices and availability are accurate as of 2019-04-22 09:04:23 UTC and are subject to change. Any price and availability information displayed on http://www.amazon.com/ at the time of purchase will apply to the purchase of this product. Your kitchen vent might not be ideally placed or incompatible in size for your new range hood. The Cavaliere SV218-ACS-RECIR-B2/F/L2-WM Ductless Venting Kit allows you to bypass a vent installation and instead pump the exhaust back into the room. This ductless vent kit is features a thick, stainless steel frame and is intended for use with Cavaliere brand wall-mounted range hoods (models SV218B2, SV218F, and SV218L2). 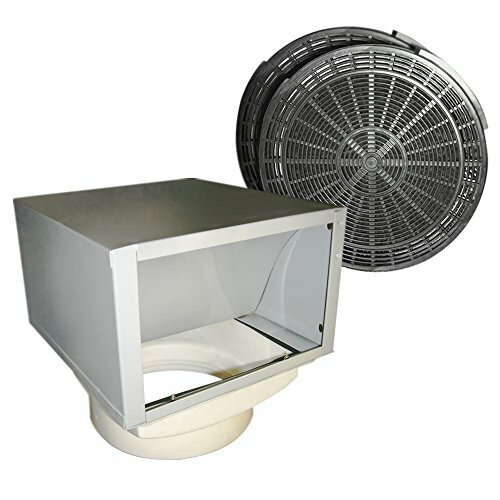 An air diverter recirculates the air through a pair of charcoal filters to remove smoke particulates, odors, grease vapors, and other pollutants, ensuring a clean, breathable output. About Cavaliere: Cavaliere offers a complete stainless steel range hood collection. They blend superior components with the latest technologies to create range hoods that cater to your needs. Cavaliere has a special understanding of the kitchen environment, ergonomics, aesthetics, and integration within your home or workplace. They specialize in wall-mounted, island, or under cabinet range hoods that make a statement in your kitchen. Made from sturdy, solid stainless steel. Wall-mounted ductless vent kit. Charcoal filters are included. Manufacturer's one-year warranty.